Do you have constant, nagging shoulder pain? Is that pain preventing you from playing your favorite sport or carrying out day-to-day chores? Or are you recovering from a recent shoulder injury? To get relief from shoulder pain, you need to do gentle shoulder exercises targeting the rotator cuff muscles – the four muscles that help in various movements of your arm. The exercises will help improve range of motion, reduce pain, and increase strength. Scroll down to know about various rotator cuff exercises. Note: Do not do these exercises without your doctor’s permission. 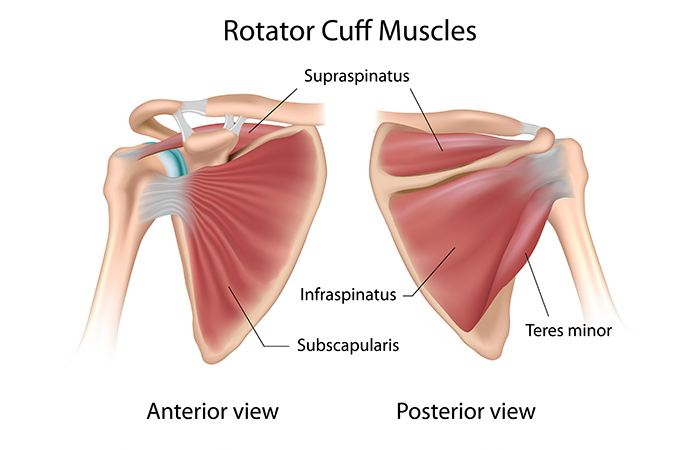 What Causes Injury To The Rotator Cuff Muscles? These muscles help stabilize your shoulders when your hands move to do various tasks. Your hand movement can range from abduction to external and internal rotation and repeated pulling (as during playing tennis). Without enough strength, balance, and stability, it would be impossible to lift your arms and do various movements freely. If you have a shoulder injury, you know that even lifting your hand becomes extremely painful. 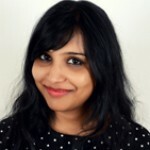 So, what causes rotator cuff muscle pain? Find out in the next section. When any of these four injuries occur, you may experience pain and other symptoms. What are the other symptoms? Scroll down to find out. If you have any of these symptoms, you must check with your doctor immediately. Your doctor will ask about your daily activity routine, medical history, and age, do a physical examination, and may ask you to get an X-ray and/or MRI done. First, immobilize your shoulder for 4-6 weeks. Second, you will do passive movement exercises for 4-6 weeks, where the physical therapist will stabilize your arm at a particular position and gently exercise the rotator cuff muscles without any effort from you. This will help improve the strength, flexibility, and stability of your shoulder joint. Third, you will perform active exercises for 3-6 weeks to further improve range of motion, strength, and flexibility. Fourth, you will perform strength training exercises for 8-12 weeks using resistance bands and light weights. In this post, I will talk about the exercises recommended in the third and fourth stages of recovery. You will learn about the various active exercises you may perform under the supervision of your physical therapist. Talk to your doctor and therapist before starting these exercises. At any time, if you experience increased pain, stop immediately and seek medical attention. With these points in mind, let’s see which exercises are best for increasing strength, stability, and range of motion after rotator cuff injury. Hold a 1-pound dumbbell with the hand of the affected shoulder. Flex your elbow so that your upper arm is perpendicular to the forearm. Keep your hand pronated. Place a towel below your elbow for support. Lie down on a mat, support your head on a foam roller or rolled towel. Stretch your other arm out in front of you. Slightly bend your knees. This is the starting position. Slowly, pull your hand up, keeping the elbow bent. 3 sets of 8 reps in the initial stage. Increase the reps and sets as you progress. Target – Rhomboids, traps, and lats. Hold the rope attached to the cable stack with both your hands. Step back and get into a staggered stance. Keep your core tight, and weight on the front foot. Pull the ropes back with your elbows going down and back. Squeeze your shoulder blades. Release the hold slowly and extend your arms fully. Target – Posterior deltoids, rhomboids, and traps. Target – Anterior deltoids, pectorals, lats, biceps, and hamstrings. Hold one edge of a broad resistance band. Secure it by stepping on the other end of the band. Twist the band in your hand for the required amount of resistance. Stand with your feet shoulder-width apart, knees slightly bent, and the free hand placed on your waist. This is your starting position. Straighten your knees and stand. As you do so, pull the resistance band with your elbow pointing back, and your shoulder blades squeezed. Target – Subscapularis and pectoralis. Stand near a doorway. Keep one foot in front of the other, your arms on the door, your elbows at shoulder level, and your neck in neutral position. Move forward slowly and feel the stretch in the front of your shoulder. Hold it for 30 seconds. Release. Do 2-3 shoulder rolls and repeat. 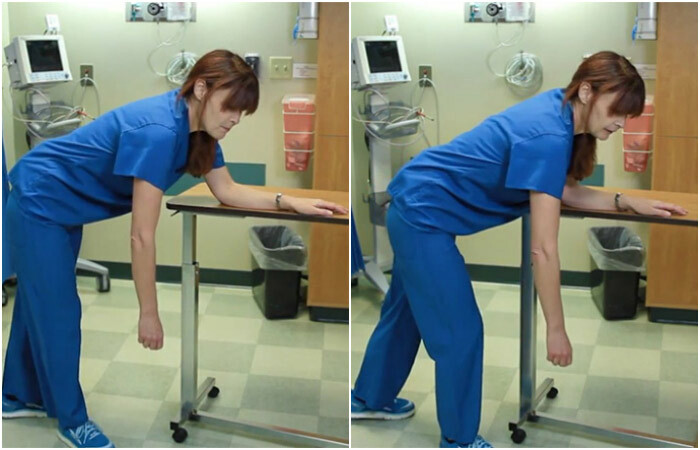 Rest your good arm on a table, lean over, keep one foot in front of the other, and the affected hand hanging. Start swinging your body so that your arm starts to swing as well. Direct the swing to clockwise and anticlockwise directions. 5 sets of 10 clockwise and 10 anticlockwise movements. Target – Posterior deltoids, lats, and triceps. Place the hand of the affected arm on the opposite shoulder. You may use your good arm as support to do so. Grab the elbow of the affected arm with your good arm and raise it to the shoulder level. Gently and slowly, pull your elbow toward the opposite shoulder. You will feel a stretch along the side and back of your shoulder. Hold it for 20 seconds and repeat. Lie down on the affected side. Keep your arm a little extended out so that it is not directly below your shoulder. Flex your elbow and keep your forearm in an upright position. Hold the wrist of your affected arm with the other hand. Gently push your affected arm down and hold for 10 seconds. 3 sets of 5 reps.
Target – Teres minor, posterior deltoid, and infraspinatus. Stand near a door with the affected arm facing away from it. Secure a resistance band on the handle of the door. 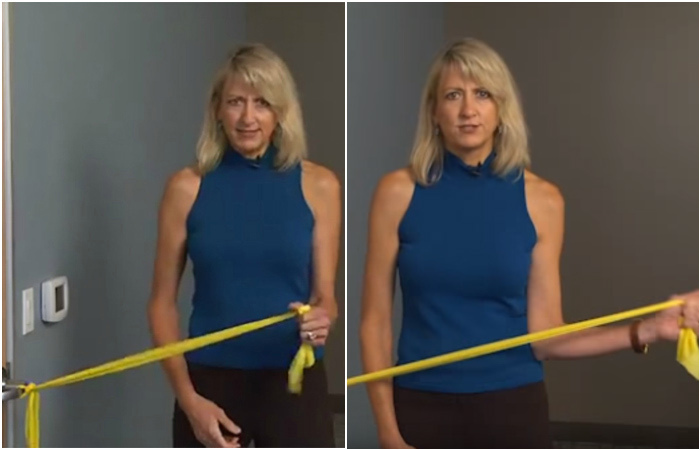 Hold the other end of the resistance band with your affected arm. Flex your elbow so that the forearm is perpendicular to the upper arm. This is the starting position. Keeping your elbow close to the body, pull the resistance band away from your body. Get it back to the starting position and repeat. Target – Subscapularis, teres major, and lateral deltoids. Stand near a door with the affected arm near it. Secure a resistance band on the handle of the door. 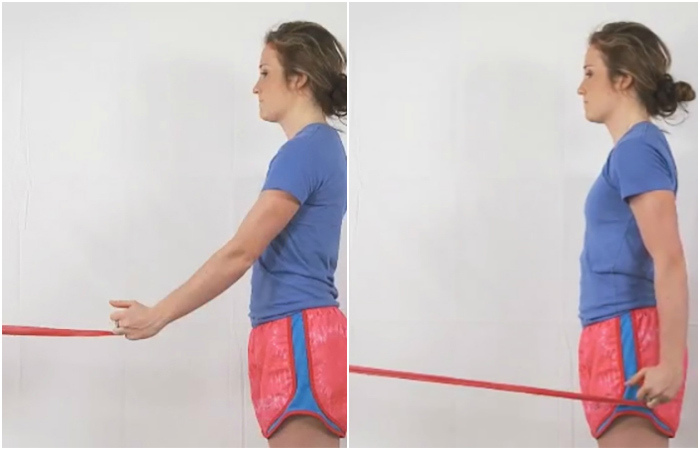 Hold the other end of the resistance band with the affected arm. Flex your elbow such that the forearm is perpendicular to the upper arm. This is the starting position. Keep your elbow close to the body and pull the resistance band toward your body. Target – Teres major, lats, posterior deltoids, and triceps. Stand with your feet shoulder-width apart. Anchor a resistance band in a doorway. Hold the other end of the band. This is the starting position. Pull the band and move your elbow back. Target – Deltoid and supraspinatus. Stand with your feet shoulder-width apart. 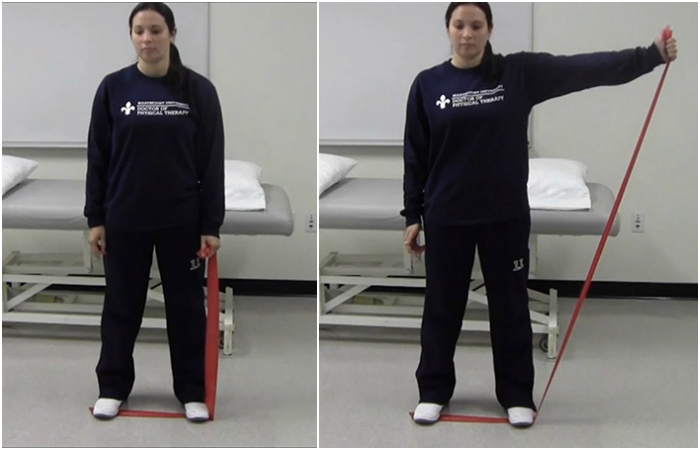 Secure the resistance band under your shoes and hold the other end of the band with the affected hand. This is the starting position. Raise your arm out to the side in a slow and controlled motion. Stop when you feel pain. Return to the starting position in a slow and controlled motion. There you go – 12 best rotator cuff exercises to reduce pain and increase the range of motion. Do these exercises, and you will feel better for sure. However, do not rush your recovery. It will take at least 2-3 months if you have had shoulder surgery recently. Take your medicines and consult your doctor before starting any new exercise. Also, inform your doctor or physical therapist if you experience increased pain after doing an exercise.